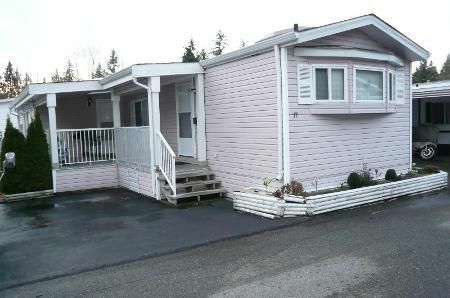 Affordable living in tastefully updated, well kept, 2 bdrm mobile home w/new carpets on self owned pad in desirable 55+ Brookswood Estates Mobile Home park. 868 sqft home boasts 4pc bath. Entertainment sized liv rm w/vaulted ceiling & cozy gas f/p. Attractive island kitchen w/vaulted ceiling, scads of oak cabinets & E/A with b/i hutch. Spacious master bdrm, 2nd bdrm doubles as a den. Covered carport & sundeck. Small workshop at rear. Stacking washer/dryer. Self owned pad through share in coop with maintenance of only $130 per month. Park has clubhouse/activity centre. Affordable living in tastefully updated mobile on self owned park. The good life just keeps getting better.